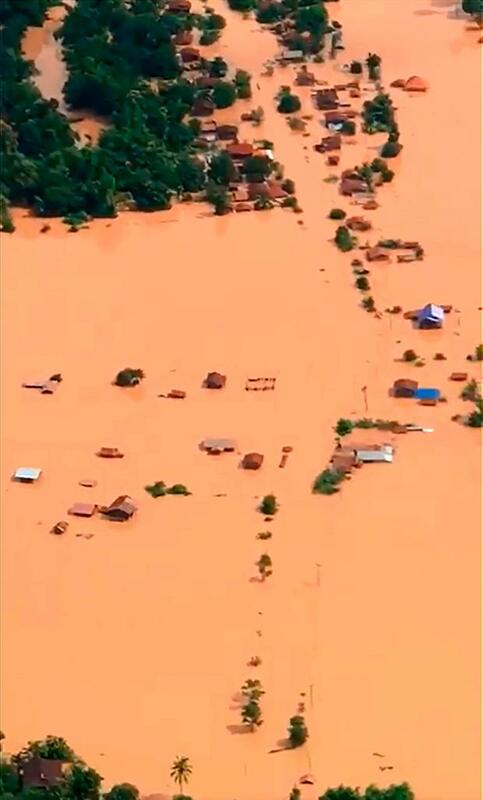 This screen grab taken on handout video footage from ABC Laos on July 24, 2018 shows an aerial view of the flooded plains in Attapeu province after a dam collapsed the day before. This screen grab taken on handout video footage from ABC Laos on July 24, 2018 shows various structures surrounded by floodwaters in Attapeu province after a dam collapsed the day before. AFP PHOTO / ABC LAOS. Hundreds of people are missing and several are feared dead after a hydropower dam under construction in southern Laos collapsed, causing flash flooding which swept away homes, state media reported on Tuesday. The disaster left more than 6,600 people homeless, the Lao News Agency reported. It showed pictures of villagers wading through muddy flood waters carrying belongings. Others boarded rickety wooden boats or stood on the roofs of submerged houses. 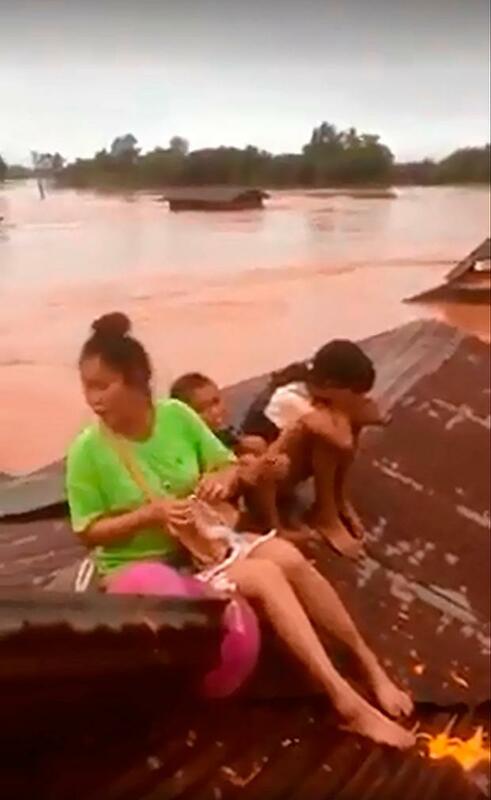 Officials have brought boats to help evacuate people in San Sai district of Attapeu province, where the Xepian-Xe Nam Noy hydropower dam is located, as water levels rise after the collapse, ABC Laos news reported. The company building the dam said heavy rain and flooding caused the collapse and it was cooperating with the Laos government to help rescue villagers near the dam. 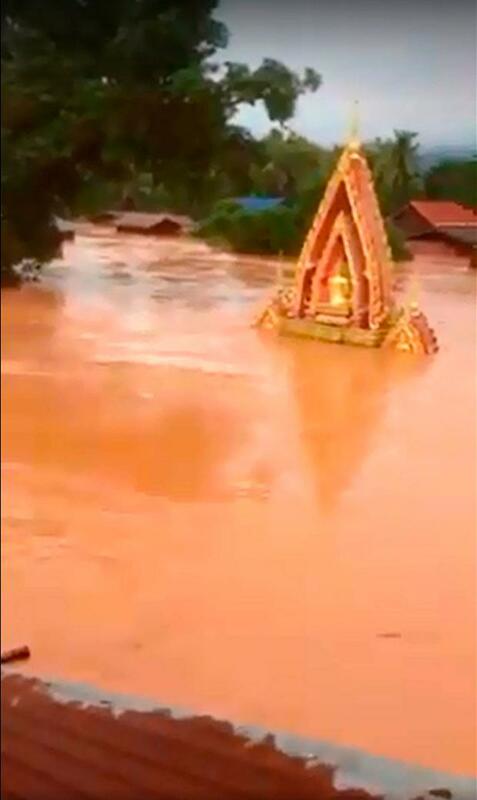 The dam collapsed at 20.00 hours on Monday releasing 5 billion cubic metres of water and several hundred people are missing and homes have been swept away, the Lao News Agency said. It said several people had died. A video posted by the ABC Laos news on its Facebook page showed villagers stopping to watch fast-flowing water from the side of a river bank. Prime Minister Thongloun Sisoulith has suspended government meetings and led Cabinet members to monitor rescue and relief efforts in one of the affected areas, the state agency reported. Communist Laos, one of Asia’s poorest and most secretive countries, is land-locked and aims to become the “battery of Asia” by selling power to its neighbours through a series of hydropower dams. The remaining 10pc of power would be sold to the local grid under an agreement between the PNPC and the Electricite du Laos. PNPC was established in 2012 by SK Engineering & Construction Co., Ltd. (SK E&C), Korea Western Power Co., Ltd. (KOWEPO), Ratchaburi Electricity Generating Holding Pcl , Thailand’s largest private power producer, and Lao Holding State Enterprise (LHSE). The dam “was fractured and the water had leaked to the downstreat area and down to the Xe-Pian River which is about five kilometres from the dam,” said Kijja Sripatthangkura, Chief Executive Officer of Ratchaburi Electricity Generating Holding Company. International Rivers said the accident exposed “major risks” associated with some dam designs that are “unable to cope with extreme weather conditions”. “Unpredictable and extreme weather events are becoming more frequent in Laos and the region due to climate change,” International Rivers told Reuters in an e-mail. “This also shows the inadequacy of warning systems for the dam construction and operations. The warning appeared to come very late and was ineffective in ensuring people had advance notice to ensure their safety and that of their families,” the group said.